Lewiston Single Handle Pull-Out Kitchen Faucet with Soap Dispenser, Stainless Steel Delta's exclusive DIAMOND Seal<sup></sup> Technology uses a valve with a tough diamond coating. InnoFlex<sup></sup> PEX waterways keep water inside the faucet out of contact with potential metal contaminants. This powerful combination brings you a faucet built to last up to five million uses. Only Delta faucets are equipped with Touch-Clean<sup></sup> soft, rubber nubbins that allow you to easily wipe away calcium and lime build-up with the touch of a finger. The included escutcheon completes the ensemble for a more finished look. 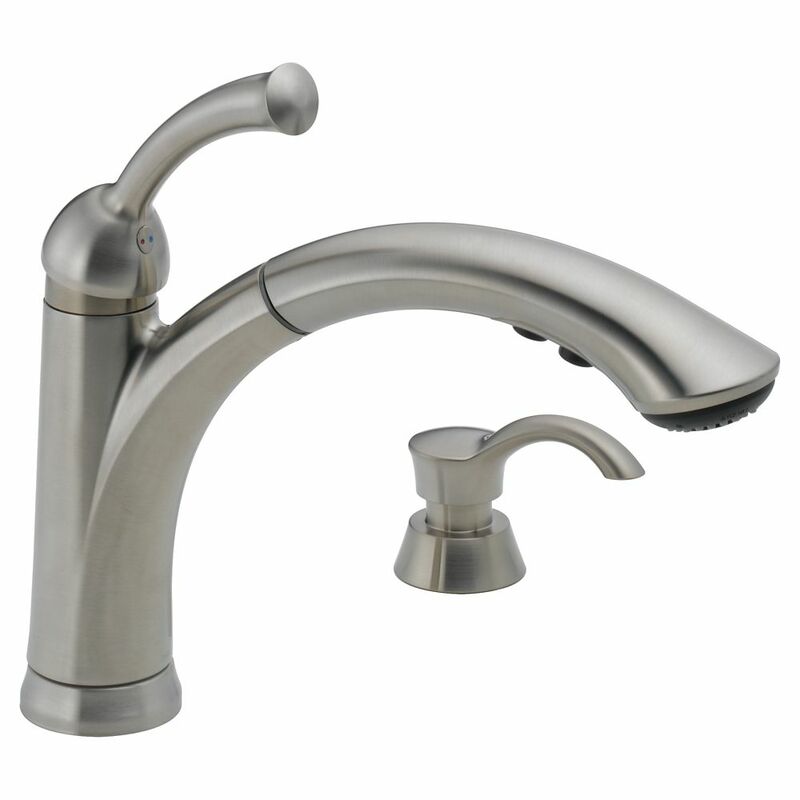 Lewiston Single Handle Pull-Out Kitchen Faucet with Soap Dispenser, Stainless Steel is rated 4.3 out of 5 by 101. Rated 5 out of 5 by Lois from Love this faucet!! Purchased this faucet to compliment a new double sink for my kitchen renovation. It more than met my expectations, the finish is easy to wipe clean, the spray control is in a handy place and doesn't splash all over when I use it, and the soap dispenser is easy to use. Great product!! Rated 5 out of 5 by Bill E from Great Prododuct I bought this model and installed it at my old house. When it came time to put one in my new house it was a no brainer. The faucet is easy to install and Delta stands behind it. What else could you wnt?